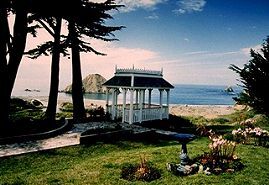 The Elk Cove Inn is an 1883 lumber baron's oceanfront estate nestled in peaceful seclusion atop a bluff on the Mendocino coast, with a front porch, gazebo, gardens and private steps down to the beach. We offer antique filled rooms, king and queen size beds piled high with down comforters and lots of pillows. Oceanfront cottages have fireplaces. All rooms have coffee makers, bathrobes, private baths and bedtime port and chocolates. The rooms are very large with rocking chairs and views. The house has common rooms with TV/VCR, books and games. A sumptuous full breakfast is served in the oceanfront dining room. A cozy pub serves local beers & Anderson Valley wines. The Inn enjoys wide vista views amidst the relaxed and romantic setting of an aesthetic rural village. Wineries, redwoods, unique shops and gourmet restaurants are just minutes away.